What do you do if you have a plumbing problem on Sunday that can't wait until Monday? You call Rotor Rooter because you will always get to talk to a person not voice mail and they will have a plumber to your house soon after your call. It was in the middle of February, freezing temperatures and we had a toilet overflow with water also coming up through the shower drain. We tried our best to fix it, but it wasn't good enough. I called Rotor Rooter and someone was at our house within the hour. After surveying the issue, they gave us a price to fix the problem. You can choose not to do anything and there is no charge. We chose to have the plumber work on it. Eventually he told us that whatever was blocking the water flow was too hard to clear out with a snake. He then gave us another estimate of what it would cost to get it repaired necessitating additional equipment and more man-power. The problem was outside, underground. We agreed because it seemed reasonable and men were at our house 9am the next morning. By mid afternoon, all was cleared and back to working order. Repairs were done carefully and the area was cleaned up really well. It was a big job and someone had to do it! Luck was on our side because the very next morning, a trememdous snow storm came through and our plumbing issue would not have been able to be repaired had we had to wait for a plumber. You can also find coupons on their site. I also get them in those packs of coupons mailed to everyone. 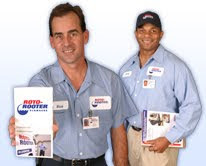 I know that there are many good plumbing companies out there, but that day we chose to call Rotor Rooter. It's all in the timing! This is a really helpful post. There are so few companies that do this anymore. Even for people in NYC in apartments, a lot of people's supers don't even work on the weekend or they take hours to even show up.